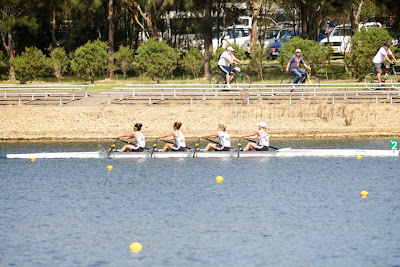 This past week, we raced at the Sydney International Rowing Regatta, hosted at the 2000 Olympic race course in Penrith. The course itself was absolutely beautiful: designed as a race course, it had ample launching and warm-up area as well as a fully buoyed 9-lane course and permanent starting docks. 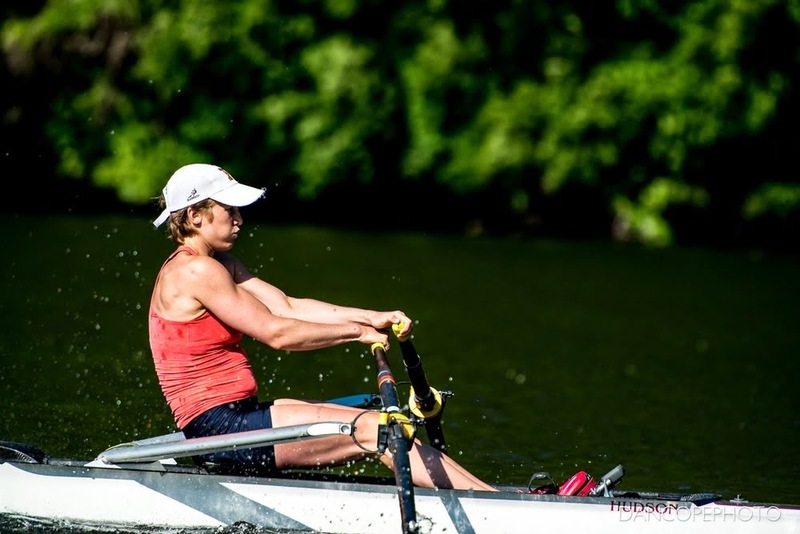 The week might have been considered a rowing festival: in one week, the course hosted the Sydney International Regatta, the Australia Open Schools Rowing Championship, the Interstate Regatta, and the first stop of the World Cup series. 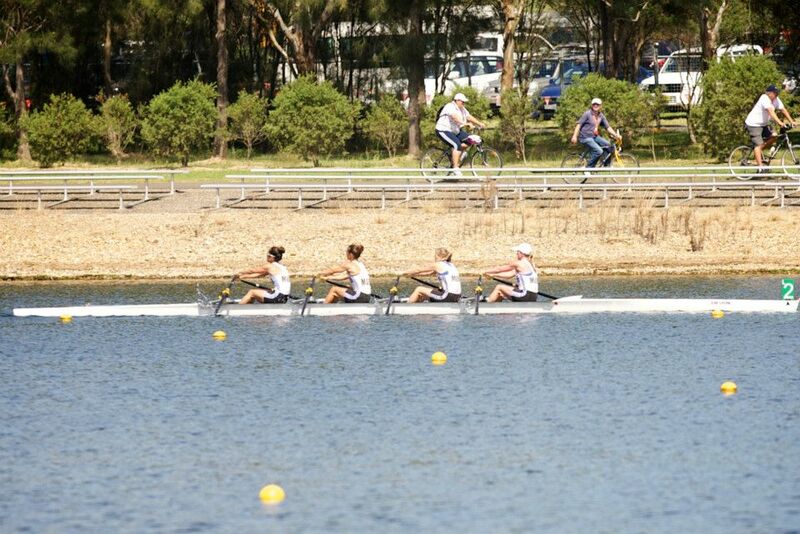 We raced the lightweight women's quadruple scull at the Sydney International Regatta. Our first race was Wednesday and was an optional race for lanes. Only three boats entered the race for lanes: us, Team Korea and Team Vietnam. We placed second in the race for lanes, just off the pace of Team Korea. are a composite crew so we don't have matching unis. The race was good practice for us: it was our first time racing in this boat and, for three of us, also our first race of the spring season. We didn't execute our smartest race plan, nor was my steering something to brag about (yea, that's right—hit a few buoys). Still, the experience helped us develop a strategy for the final and learn. It also gave us an opportunity to practice a weigh-in, which helped with our confidence about the Friday weigh-in. Friday's weigh-in was also without drama. In fact, we only spent 10 minutes sweating out for that weigh-in, as opposed to the 20 minutes we spent on the first one. Once again, I wished I'd eaten a bit more for breakfast, but I did have a granola bar, some walnuts and I snuck a bite or two of peanut butter along the way. Because we participated in the race for lanes, we got a middle lane draw for the final. We were situated in lane 5, with Team Korea just off to our left in lane 4 and the eventual 1st and 2nd place crews just to our right in lanes 2 and 3. At the 500m mark, a quarter of the way into the race, we were even with the eventual 2nd place. We held in the mix, around 3rd place, through 750m to go. From there, our lack of racing experience really show through as we posted the same split time for each of the final three 500m segments. We finished in 4th, 6 seconds behind the winner and about 3 second behind Team Korea. Ultimately, that was a great result. We definitely have work to do, but in many ways, this race was like comparing apples to oranges. We have established that we are not potato chips, i.e. we are actually competitive with these crews. Still, this was the final race of their summer racing season (in the S. hemisphere, summer is winding down--this was their national championships), and an incredibly early season race for us. With a bit more race strategy, and improved fitness levels over the next few months, we hope to produce an incredibly internationally competitive quad. While it would have been nice to take home an international medal, that was not the goal of this regatta. We have other medals and other standards to chase, and this regatta helped us develop a plan for forward progress. I will be back stateside soon, ready to make some solid progress on my training. Over the coming months, I need to significantly improve my 2000m erg time, dropping upwards of 8 seconds, if I hope to keep my seat in the LW4x and compete for international medals.